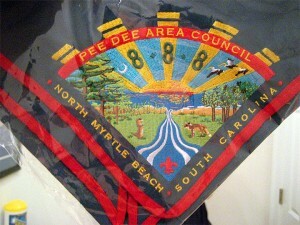 Here’s a look at a neckerchief that I helped design for the local boyscout troop. Anyone who guesses all the South Carolina symbolism will win a prize. Yeah, I’m pretty ignunt, but I AM proud of your handiwork. What a COOL thing, Suzanne!! You rock!